"Never in Ink is a clever, classy, and polished tale that adds glitz and glamour to the hardboiled private eye genre. Marilyn Jax offers the kind of strong plotting and colorful locales not seen in her more noirish contemporaries. She is every bit the equal of Sandra Brown and Nora Roberts, as well, serving up a steamy, red-hot tale with plenty of sizzle on the side." 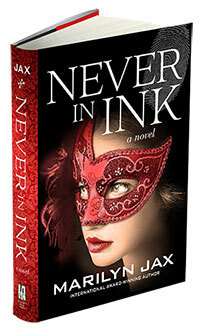 "Never in Ink is truly a captivating mystery that grabs you from the prologue. Jax has constructed another Caswell & Lombard tale that brings the characters to life in a very real way. Hang on for a page-turning read and an ending that does not disappoint."